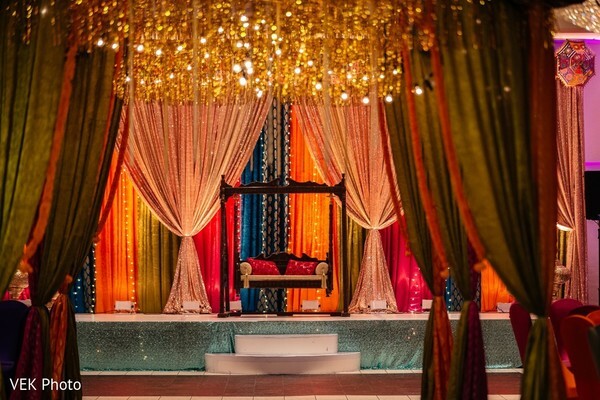 Lose yourself in all the energy and colors of Kiran and Malik’s Sangeet celebration. As part of their long list of events, the lovely couple started their festivities twirling among their dearest and nearest at the Crystal Banquet Hall! 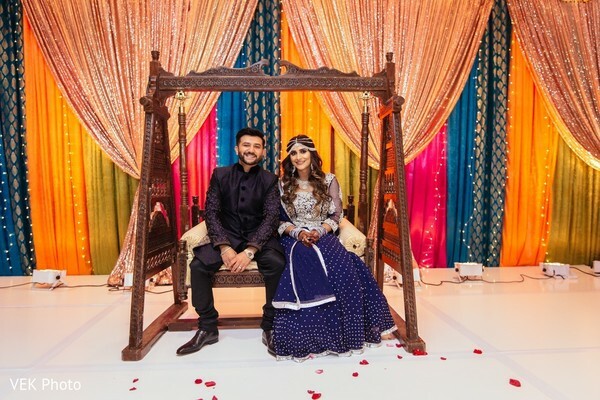 The energetic setting created by Wedding Decor By Faiza resembled a Bollywood film with a bubbly décor; from a brightly colored draped sweetheart stage to a breathtaking aisle decorated with shimmering fringe curtains, the entire place was a frenzy of color! 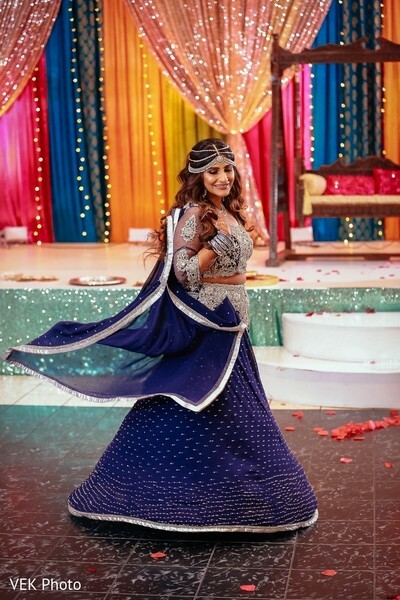 On her opening night, Kiran hit the stage on a stunning glitz blue trousseau that she perfectly paired with a mind-blowing matha patti to adorned her lovely hair waves! 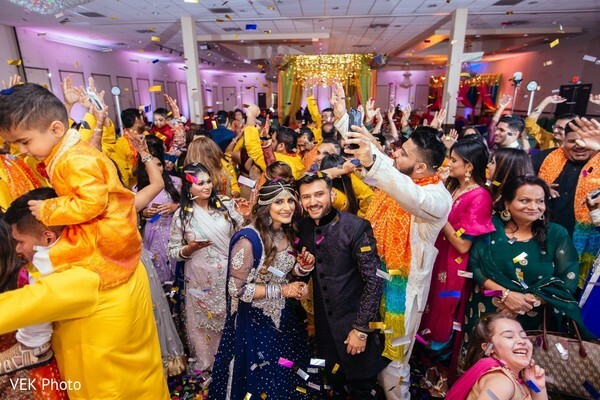 Vek Photo captured all the greatest moments of Kiran and Malik’s big pre-wedding celebration and followed these two all the way through their wedding journey! 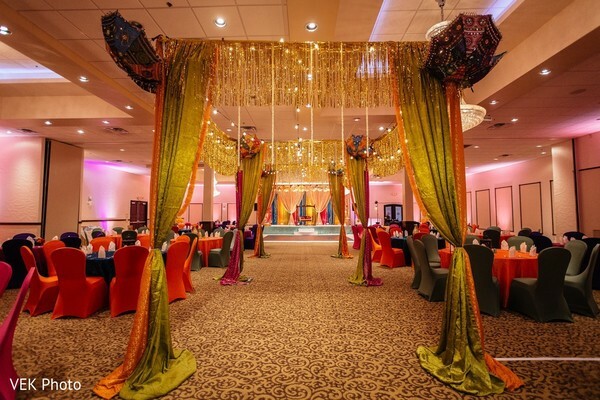 Check out the highlights from the colorful Sangeet event in our full gallery! We actually met online; a month after talking online we had our first date in Dallas. We had so many similarities it was hard to stop talking, it was like seeing a guy version of myself! We actually are from the same neighborhood back home and were in the same religious services every night (without knowing each other of course) Our parents were also familiar with each other. We both thought the other one was lying to get points because when we would talk about our childhood, it was always a "oh my god me too!" that followed. I knew he was the one since he would call and check up on me on days which he knew were hard. He also would ask about my parents and their wellbeing and that was the icing on top! Well after we both told our parents; we had an official engagement ceremony in April 2017 but he did not want to present the ring then (since he wanted to propose). Both of us being from very traditional families; he proposed after we knew we were getting married. It wasn't the same kind of surprise you get with most proposals but it was magical nonetheless. While prepping for the wedding, one of those nights in early October, he popped the question during a romantic dinner. We had less than 5 months to plan a 4-day event for 400 people. Planning was done by the both of us and my very handy Pinterest board. We decided on the venues together, he actually drove me to Houston to order my reception outfit! I knew exactly the kind and colors I wanted to go for in terms of outfits since high school (Yes, I was one of those brides). As far as decor, I had saved plenty of ideas and I knew I wanted to go through Weddings by Faiza since she had done a phenomenal job during our engagement. Even after getting several referrals and calls from decorators themselves; I knew from the beginning that I wasn't even going to chance anyone else. She listened to my ideas and brought them to life + more! Everyone was in awe every single day and I'm so so glad to say that she has now become a good friend and a future planner/decorator for any upcoming events. As far as hair and makeup- being completely clueless when it came to pro makeup- I went through my instagram and immediately fell in love with Sarah Aasif. I went to her for a trial and knew she was the one before she even picked up the brush! Seher, who also works alongside Sarah was also the best! Both of them literally turned my looks into something beyond my imagination! For my reception hair and makeup, I had JTorry who brought my whole "royal theme" into my hair and makeup! I couldn't have asked for a better team! I've always knew I wanted maroon and gold for my reception outfit. When I visited Panache By Sharpen; I fell in love with one of the lehenga she had. This was after failing to find what I wanted in countless stores. I custom designed my top and she had it made exactly how I wanted it. I mix-matched my pithi outfit with two outfits and my sangeet outfit was custom made with my design. One thing I did always say was that I would never be caught wearing pink and I actually ended up falling in love with a pink top (which I used during my pithi). My Nikah sari was custom made by Rozy Poonja of Organza/Rohp Indian Bridal. Rozy was like the fairy god mother who magically had my sari made in such a small time frame! My Nikah sari was very heavily embroidered with very intricate lace work and Rozy made it happen all within 4 weeks which was faster than any of my other outfits. The most enjoyable part for me was when Malik would come in town and we would go see Faiza for our decor. Those appointments would last hours because of all the thoughts/ideas I would have. Faiza always took time out to listen to my concerns, even if they were silly. I think my meetings with Faiza were the only "stress free" part of the wedding planning on my end! Almost everyone we talked to was in love with our decor, food and the theme. Which of course made all of those stressful moments worth it. Our first dance, and how I was mumbling to Malik that the fog machine wasn't on at some points, haha. But then he always brought me back to the moment and I am so so glad that we both enjoyed our wedding! We danced, ate and danced more which is exactly what I wanted to do. Malik's family had a surprise dance during the sangeet in which I also took part in. I danced to two songs from the 90's which I knew Malik loved and went perfectly with our relationship. Our sangeet theme was "Pakistan." 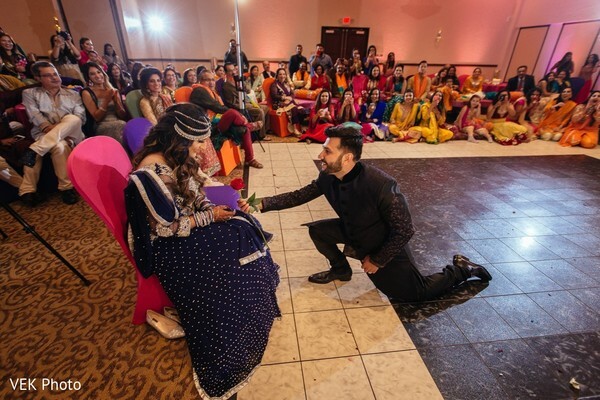 Since we both grew up going to weddings in Pakistan, we wanted our guests to feel as if they were in Pakistan. Our decor for that night consisted of canopy tents, string lights, umbrellas, a swing set and food carts with the following menu: Chaat, Karachi Haleem, Boti rolls, Bun Kababs and of course to top it all we had Karachi style Gola (snow cone) and Kulfi. The food was done by Chilli Pepper Caterings, dessert by Agha Juice and Food carts were of course provided and decorated by Faiza (Decorator). Express your ideas and concerns! Do you! Enjoy your wedding, don't be stuck sitting on the stage the whole time! Take plenty of bride/groom portraits! My mehendi was done by Kiran Meghani of KMhennaartistry. She was such a sweetheart and knew exactly what my style was since she also did my engagement mehendi. Our cake was done by Delicious Cakes in Addison and our cake serving sets were custom ordered from Ukraine to match our decor. I definitely wanted something different for my bouquet and Sadia Shah took my idea of a hanging bouquet and brought it to life! There is still much more to see! Don’t go anywhere! 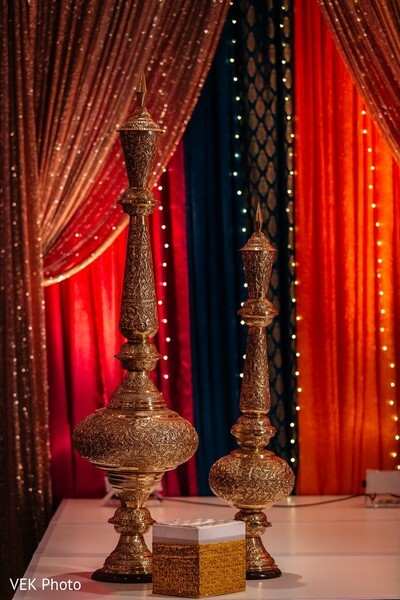 DJ Riz Entertainment, Wedding Decor By Faiza, Vek Photo and Hilton Dallas/Plano Granite Park are members of the Platinum Guide. Love what you see? Explore their portfolios.